A good bath is a great way to refresh your mind. Nonetheless, it is important that you still have the best steam shower costs even if you had a sophisticated model installed in your home. In this post, we provide you with some of the best steam shower units that are recommended for modern homes. We have reviewed the best steam shower units. Every unit that we settle on we did so after comparing it with a few models that other reviews have highlighted as the best. In short, we researched on customer experience, pricing, inbuilt features, reviews, and overall unit performance and efficiency. Take a look at what we have prepared for you. Ariel Platinum Left Configuration DZ959F8-BLK-L Steam Shower paves the way for use as we look at the best steam shower reviews. It is a great steam shower and has some of the best features that you will find today. For starters, this steam shower is actually very sizable. It measures 47 x 35 x 89 inches in exact dimensions and will, therefore, take very limited space in your home. The set up comes with a left-sided plumbing system and also drain location. It has a highly reliable shower system that offers various bathing modes including 6 jets for body massage, easy to use and super flexible handheld showerhead, and more importantly a rainfall ceiling shower technology. Even better the steam generator is very economical and will use the only 6kw to produce some of the highest steam temperatures in less than 2 minutes. Thanks to the overheat protection you don’t have to worry about damaging the system with pretty high temperatures. And the one feature that we found most users love is the shower’s aromatherapy and chromatherapy lighting systems that soothes your tired nerves as you clean up. Then again for people who love to get entertained when hitting the shower, there isn’t any need to come with your earphones as this 500-pound shower system gives you an FM radio to go with. 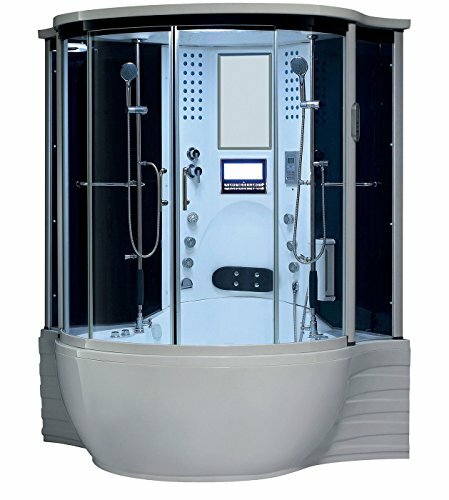 The next best steam shower is the 2019 Florence Steam Shower With Sauna, Jetted Jacuzzi, and Whirlpool Massage. This shower measures 57” x 57” x 87” in exact dimensions. Indeed this is a good size in case you don’t have so much freedom of space around your bathroom. More importantly, the shower system comes with a computerized stem shower control panel for quick access and ideal settings. It also has an 8.4" inch LCD TV for those who love to whisk their shower time away with some of their favorite TV programs of music. More importantly, the system is very economical and comes with a 4KW steam generator that has a 220V capacity and which enjoy the ETL Listing Certification. And when we were looking at this shower system, we found out that it came with a 10-year warranty offer, white color, and some of the best tile for steam shower designs. This Steam Shower which comes with built-in heater pump and 30 whirlpool massage jet is slightly heavy though. It weighs about 800 pounds but still fits nicely in your bathroom corner. 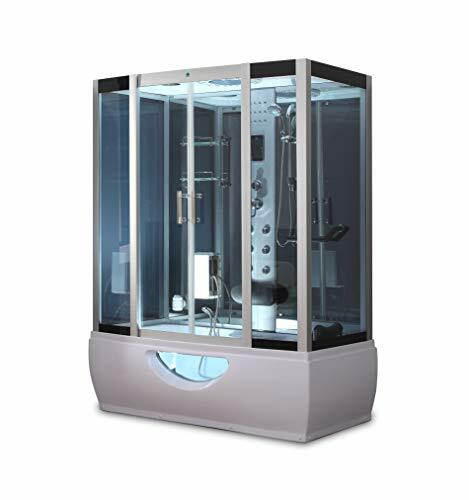 52" x 39.4" x 85.4"
Like many top-rated steam shower reviews say, the Aston Body Jets ZA219-R 24 Steam Shower System is indeed an extraordinary enhancement to any shower space that you bring it into. It offers all the functionalities of a normal shower and includes a highly steam generator. 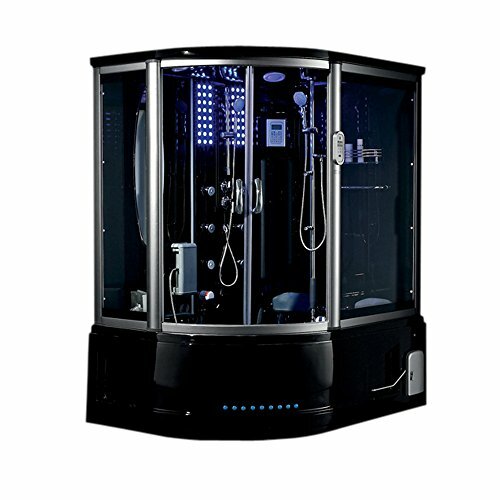 The system is easy to control and comes with a computerized control panel, handheld shower, rainfall shower, and 24 directional body jets. If you are looking for an elegant steam shower selection Aston will bring in the touch of style and luxury, thanks to its pre-installed thermostat system and diverter valves that are super-efficient and very easy to use. The design is made of high-end fiberglass, reinforced acrylic, and top-rated aluminum framing. It has a built-in 3kw steam generator and a 5' shower hose made of brass. The water temperature is also easy to regulate, thanks to the system’s thermostatic faucet that will help you to easily adjust and maintain temperatures. This 300-pound steam shower is pretty easy to fix. It measures 52" x 39.4" x 85.4" and offers a number of entertainment options including an MP3 compatible system, FM Radio audio input, and high-quality speakers. The ARIEL Platinum Black DZ972-1F8-BLK Steam Shower uses a 6kw built-in steam generator with a top-rated digital control panel. This makes it one of the most efficient and easy to use steam shower systems that you can get today. It weighs about 800 pounds and measures 59 x 32 x 87.4 inches in dimensions. The steam is usually produced in under a minute and will save you so much time. Thanks to the super-efficient built-in heating pump that this system comes with. Even better, it has over 20 whirlpool massage jets and about 5-acupressure massage jets that you can easily use to get the best shower experience after a long day at the office. The system is MP3 compatible and offers some of the most popular showering systems including the best foot massage, rainfall ceiling showers, and a steam shower unit. 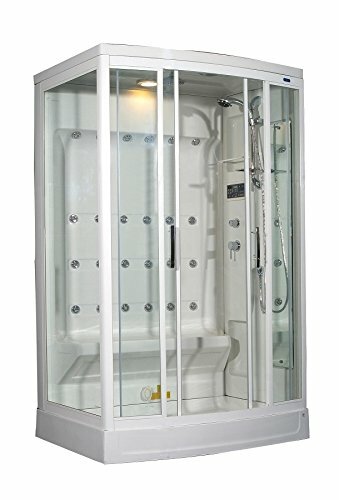 Its high-quality built-in speaker systems make this uniquely designed acrylic shower unit a great entertainment area while the reinforced fiberglass gives it the durable backing it needs for a longer lasting experience. Personally, I loved it because of its solid stainless steel touch around the frames and more importantly, stylish door handles, additional towel racks, and also easy to reach shampoo racks that add efficiency to the beautiful tempered glass. This beautiful steam shower unit offers a free-standing design that’s packed with numerous features to go with. Indeed, the Modern Corner Steam Shower System 36" x 36" with Back Massage Jets and LED Lighting offers a uniquelifetime bath steam shower technology that will save you so much money. It is fitted with huge monsoon rainfall shower head and an easy to use hand-held shower system and riser. The back jets are so much pulsating, while the foot massager offers the best comfort in this shower system. However, that’s not where it all ends. This steam shower system has a one-touch digital screen control panel that’s pretty easy to use. It offers multi-functional sliding handle, calling phone, CD/MP3 playback, FM radio, and LED mood lighting for a powerful touch of shower entertainment so you never get bored. The system is also fitted with fog-free mirrors and glasses and offers an efficient shower system with the 6 body massage jets and overhead rainfall showering systems. Its computerized control panel works so well with the digital timer to maintain the best water temperatures for a cool bath before bed. For people who have the best Kohler steam shower systems and want a different design for their space, we highly recommend the 58" x 33" Soaking Base Steam Shower with Lights, FM Radio and Hand Shower. This extra spacious and beautifully designed rectangular-shaped shower system comes with a super cool free-standing base unit. It is packed with many features and offers one of a kind in-built ventilation system to maximize its efficiency. The steam shower comes with a set of huge monsoon rainfall shower head design and also a hand-held shower system. The back jets are quite pulsating and will add onto the cool touch that the foot massaging system offers. Using this system is energy efficient too. Thanks to the powerful 3KW inbuilt steam generator system that will measure up to its work anytime. More importantly, this system is also easy to use just like the best Kohler steam shower systems, it has convenient glass shelves, digital touch screen control panel, and an easy to follow user manual that enables you to easily manage every wonderful feature that this 58 x 33 x 80 inches 600-pound shower has. 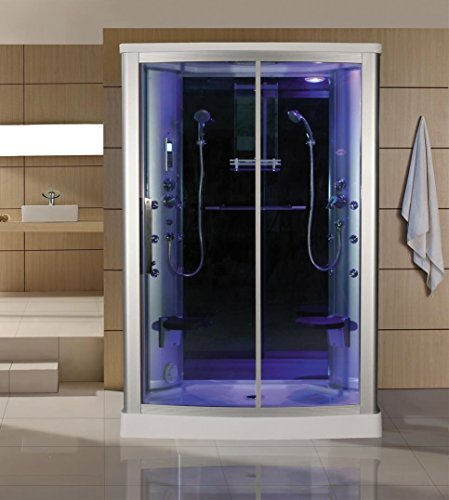 For a residential steam shower,the 2015 Milano Acrylic Lifetime Bath Mind Relaxation Spa Steam Shower Unit would be a great feat for your home. It is white in color and enjoys one of the best steam shower enhancement systems for the limited home spaces that we have today. This steam shower has the normal functionality of any other standard shower but amps its performance with an inbuilt steam generator and a digital control panel that makes it really easy to operate. It has an overhead rainfall shower system, handheld shower design, and body jets technology like no other regular steam shower systems. It is elegant and enjoys one of the best pre-installed thermostatic and efficient diverter valves that enable it to maximize its functionality. Made of extremely durable fiberglass and reinforced acrylic this steam shower system is one of the best residential steam showers that you can have today. It enjoys the best aluminum framing technology and has its steam generator at a capacity of 3kw. The system will always produce steam in under 5 minutes so that you can enjoy its system and also its directional overhead rain shower system. Apart from all these, this 52" x 39.4" x 85.4" system that comes with a video and audio entertainment also allow you to control the temperatures by the use of a push button on its control panel. 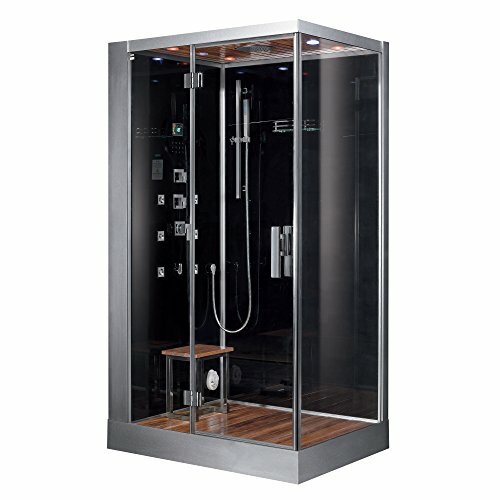 Sliding Door Glass Steam Shower Enclosure Unit is one of the best steam shower units if you are looking for an eco-friendly touch. It uses up to 110V and is ETL approved that it meets the US and Canada electrical safety codes and design and also provides the best steam shower costs. 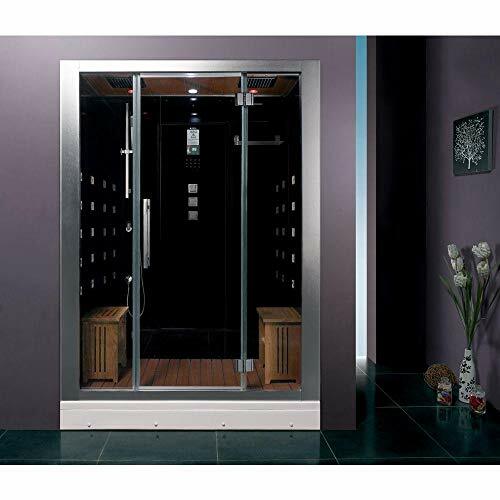 The steam sauna is fitted with a 3kw built-in generator and comes with up to 12acupressure massage jet systems that you can alternate between depending on your needs. In addition to that, the unit enjoys a built-in audio and video entertainment system including LCD screen, built-in FM tuner, and marine grade speakers that will amp your space with top rated tunes as you whisk the time away. 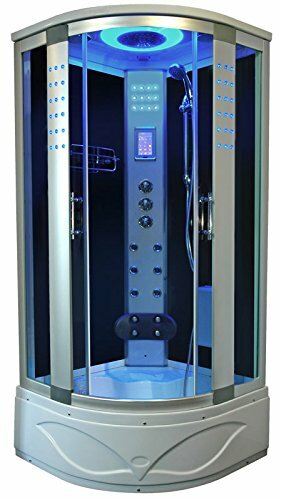 However, many people who have this unit hail it for stylish blue glass color and additional top rated features including tempered glass, sliding door design, and self-cleaning steam generator set. The system comes with a digital control panel that makes it easy to use. It is spacious and measures 55 x 35 x 85 in exact dimensions. The unit also weighs 330 lbs and comes with a 2-years warranty. If you want the best lifetime bath steam shower for your use, you should focus more on the following attributes. The size of the steam shower will be your very first consideration. This should be done vis-à-vis the amount of space that you have in your home (LxWxH). Taking the dimensions of the space in which you want to fit the steam shower, you can then find a unit that fits well in your space too. Price plays a key role. And when I say price I mean the overall cost. Usually, a steam shower might be quite affordable for you. However, the overall cost of installation and maintenance might shoot the costs a little higher than you can afford. So always take a keen look at the cost before you buy. Steam shower units need to be very durable. It is a huge investment that if you could lose it before you get the value for your money, you will be greatly saddened. Look for a number of features that make your favorite steam shower unit extremely durable. Some of these features include. Many people tend to ignore the most important features of a steam shower unit and rush to things like audio and video entertainment. I am not saying that it is wrong, hell no! However, you should start with the most fundamental features first. Here is a list of some of the best features in order of priority. Before you install your steam shower unit you will have to move it. In case you intend to move or possible change your room setting you could also move it again. Choosing a slightly portable design will be very ideal. Nonetheless, it should also be understood that if the unit is weighty enough, it makes it much more durable and easy to handle too. Finally, having a steam shower unit that you can access remotely will be very ideal. It will reduce on wear and tear, add on its convenience and efficiency, and enable you to maximize the use of the steam shower unit’s features. Most of these units are real-time investments. It means that they cost some pretty huge amounts of money. Because of that, you could easily find yourself without one even if you intended to buy. These tips that I am going to give you will help you to buy the best on a limited budget. Buying goods online is the next best thing that ever happened after the internet. Buying online often gives you so much leverage. You will have numerous products to compare and tones of prices to check. In addition to that, the shipping costs are often affordable and you don’t have to drain your pocket to get your steam shower unit to your doorstep. We highly recommend starting out with this option if the money is limited. Remember, a good steam shower comes with tons of features to go with. Buying one unit that has pre-installed features including handheld shower systems, LCD video entertainment, and fog-free glasses will help you to save the money that you would have used if you were to do all these things alone. The reason I am always stressing on warranties when it comes to investing so much on anything is that warranties will save you some money in case of manufacturer defects. In fact, having a warranty might waiver all the fees that you would have paid to get your shower unit fixed in case of any defects. This will be cool if your warranty lasts longer as it saves you much in a long time. User reviews are also another potential way of getting the best steam shower systems on a budget. With real experiences, feedbacks from previous users will point out the pros and cons of a steam shower unit so that you don’t spend so much and end up with a lofty unit or spend so little and still have a poor one. Good reviews will help you to compare designs, brands, and equally their performances. I want to separate discounts and offers for a reason. Discounts will come at any time and are not regulated with additional features. Discounts can come on the number of units you buy, period of purchase (off-peak or peak), sales of the product, and market entry. Discounted prices like warranties and offers will help you to save a few extra cash and even leave you with a great model. Now you have it all laid out. You can buy your best steam shower and get it installed in your home in no time. Most showers that you will buy will only last if they have a durable framing and possibly some of the top-rated features that we have mentioned here. I highly recommend pre-installed steam shower systems that have high tech temperature control systems as that will allow you to customize the whole system in a way that it fits your needs and lifestyle. Nonetheless, you can also go with steam shower systems that have been approved to be energy efficient so that you don’t spend so much on power. ETL approved systems such as the ones that you will find in the US and Canada are some of the best units that you can buy today. Most of them are highly efficient and will use a very limited power supply always.